When I heard that Olivia Colman and Helena Bonham-Carter were going to be in The Crown I just had to pop along to see if I could catch a glimpse. Not for the first time in my life, and probably not the last, I had got the wrong end of the stick and the aforementioned ladies are apparently on the cast list of a Netflix programme of that name rather than the Chinese restaurant in Gower Street. I had been told by Leeds Living’s copy editor that the dim sum is highly rated, so I thought that I would give them a go. The sign outside the premises proclaims it as being Crown Buffet, which would have normally had me fleeing in the opposite direction but, as I was eschewing this for the snack section, I entered. Crown is old school Chinese, not in its concept but in that it is situated in an old school which was opened in 1875 and served Leyland, one of the most deprived areas in the City at that time. Thankfully, things have bucked up more than somewhat nowadays and it is a hub of industry. My first experience of dim sum was in 1982 when my favourite Chinese restaurant, Sang Sang, moved from Lower Briggate to the Headrow, where it expanded its menu to incorporate these small portions. At the Sang Sang, now long gone, they were served mainly on a Sunday and partaking of them was the perfect way to while away the afternoon before shops were allowed to open on that day. It also meant that parking was free and unrestricted on yellow lines. 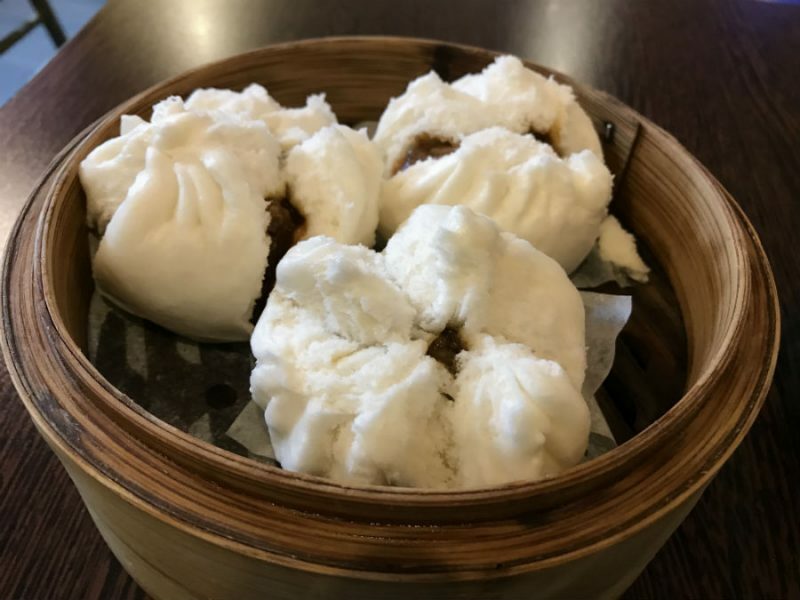 Dim sum is small portions of food which are normally served either steamed or fried and include things which are a little different from the norm. That being the case, I decided to order one steamed, one fried and one odd. From the fried section I opted to have something fishy in Deep Fried Squid Rings at £3.80, which were excellent. 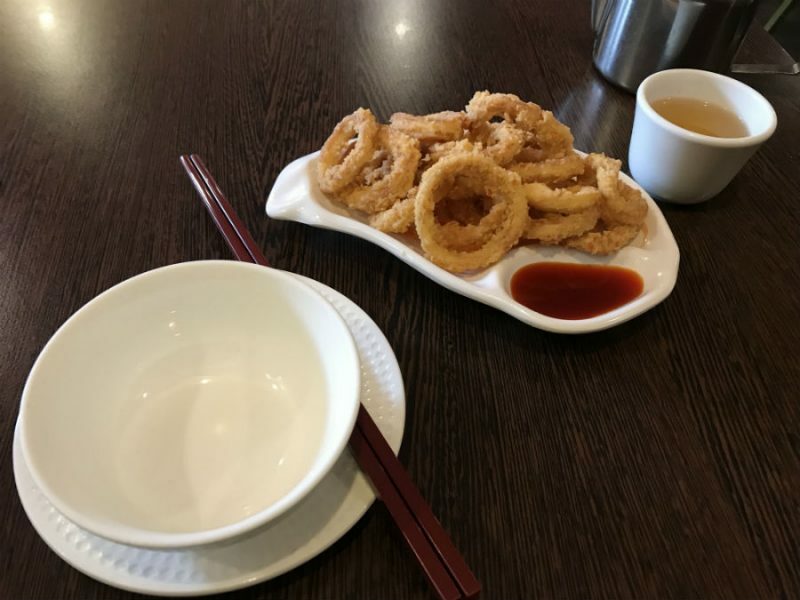 If overcooked, squid and octopus can have the texture of elastic bands, but these were coated in a breadcrumb and fried to perfection so that they were crisp but the filling retained its tenderness. There was some dipping sauce which gave the rings a bit of oomph and which I used to lubricate my second choice, Roasted Pork Bun at £3.50. The buns were fantastic, very thick but light and filled with a dollop – excuse the technical term – of pork stew. They were delightful but could have done with something to alleviate the dryness of the bun, hence the utilisation of the dipping sauce. Back in Sang Sang days I had noticed a dim sum which always intrigued me but which I never got round to ordering. 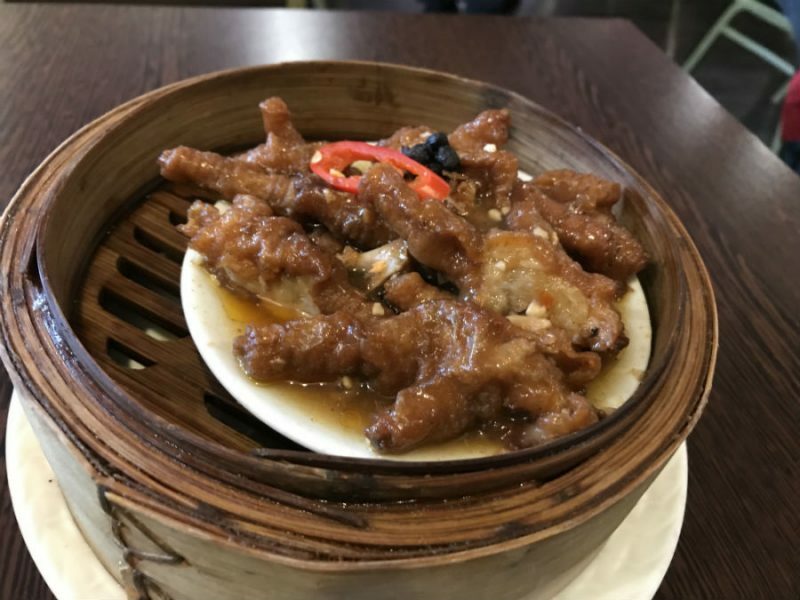 Today, however, as I was not paying, was the perfect time to experiment, so along came the Chicken Feet in Black Bean Sauce, £3.50. They didn’t come of their own accord you understand; they were cooked and on a plate. The waiter, who was extremely helpful, gave me a crash course on how to eat them. It is not a very elegant process as you pick them up to get the meat off the bone. It is also not very straightforward as there are several small bones and they must not be swallowed. The black bean sauce meant that the flavour of the meat was somewhat masked, but I found them to be glutinous of texture, being more skin than flesh, and, as one would expect, not exactly filling. They are a delicacy and so eaten on special occasions rather than for sustenance. The waiter told me a joke about a High Ranking American at a state banquet who was given chicken feet and picked up a knife and fork. Etiquette decreed that everyone else had to follow his lead, which led to mayhem as you can’t eat them with western cutlery and the Chinese didn’t know how to use a knife and fork anyway. Those Yanks, eh! I am really glad I tried them but will probably not be rushing back for seconds. The sauce did come in handy once again for the pork buns. Although there is a range of drinks on offer, both alcoholic and soft, I went for my favourite brew of tea, the subtlety and dry taste of which complement Chinese food no end. 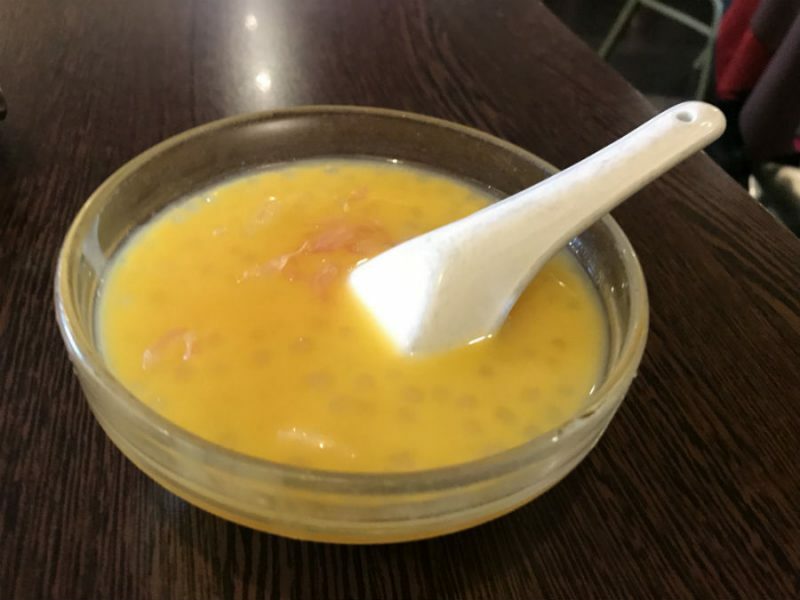 I had to try a dessert and was thinking about being adventurous yet again by having the Papaya and White Fungus Sweet Soup, but my waiter buddy steered me towards the Chilled Mango Sago Cream with Pomelo at £3.60. I would like to thank him for this as it was delicious. I was one of those kids at school dinners who loved sago pudding so this was a special treat and the chunks of mango gave it a brilliant texture. When I had finished lunch I introduced myself to the waiter and had a chat with him about Sang Sang, which he remembers fondly, and also the buffet, of which I saw no sign. He said that they now do an à la carte buffet, meaning that people choose their dishes from the menu and smaller portions are cooked to order so that they are not left lying around in a bain-marie for hours on end. Chinese food, especially stir fry, needs to be served and eaten as soon as it leaves the pan, so this is a great way to do things. The diners are more than welcome to order extra portions or more dishes if they wish. I should imagine that this also cuts down on the dreaded waste of food. I am always appalled at ‘all you can eat buffets’ when people pile up their plate and then leave half of it because their eyes are bigger than their bellies. Well done Crown on getting this right. I do recommend the restaurant for its friendly staff, well cooked food and extensive menu but I would just like to inform the waiter that it is my job to do the jokes, Sunshine!